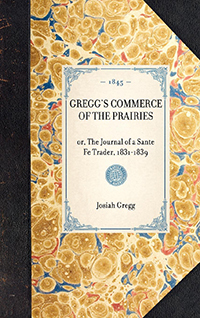 "Josiah Gregg's Commerce of the Prairie, published in 1844, is based largely upon entries made into his own journal over the nine years that he lived in Northern Mexico and traversed the Prairie as a proprietor in the Santa Fe Trade. 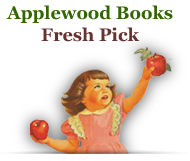 In utilizing his entries to create this work, Gregg's aim is to provide readers with an account of the history and the ""present"" condition of trade in the new west and the people of the Prairies. As an amateur naturalist, Gregg's work describes the plant, animal, and mineral resources of the area, while also providing unique information on the Native American tribes of the region. 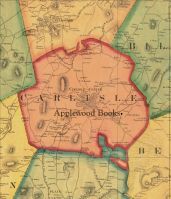 The maps he included were prepared largely by himself, with ""portions of the country which I have not been able to observe myself,"" chiefly been laid down from manuscript maps kindly furnished me by experienced and reliable traders and trappers, and also from the maps prepared under the supervision of United States surveyors. Gregg's love of the area is evident in his work, drawing readers in and giving them an unprecedented insight into the area and people around Santa Fe in the mid-nineteenth century. "